1. Wander off down garden and dig up a few carrots. While you’re there, see if Phyllis and Clarice have done their eggs and if they have, say “thank you very much” and bring eggs back to kitchen. 2. 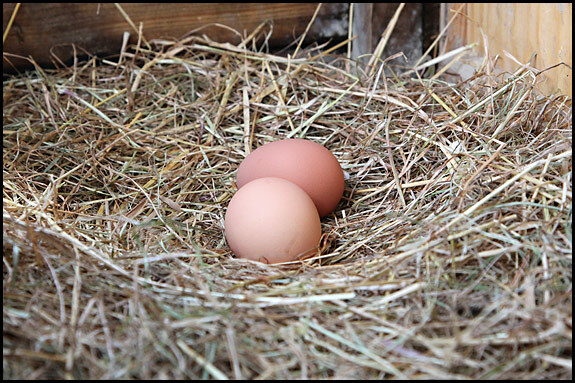 Put eggs in tray in kitchen. 3. Go back down garden and retrieve carrots from roof of chicken house. 3. Furtle about under stairs and find stone jar in which are stored last of walnuts gathered from tree by roadside on way to Farm Shop last year. Crack one open to check if still OK, then open some more to go in cake. Eat remainder and be amazed by how well they stored. 5. 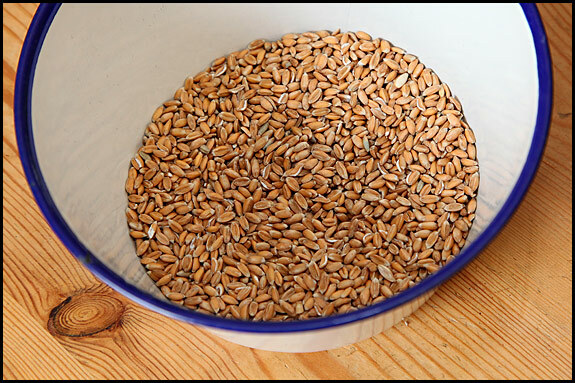 Go to grain bin and take out 4 ounces or thereabouts of organic spelt grain. Remind Elsie that we need to order some more soon. 7. 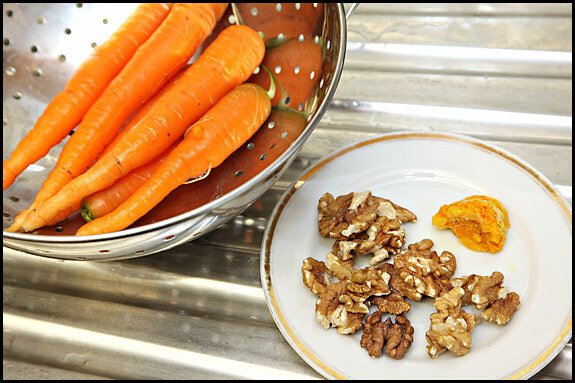 Chop walnuts, and grate a couple of the bigger carrots. Save the others to accompany next meal. 8. Put oven on to warm up to 180°C. 9. Empty fruit, cycling gloves and piece of string from medium-size Mason Cash mixing bowl which doubles as fruit bowl, blow dust out of bowl, and put 4oz organic butter plus 4oz unrefined sugar in it. Stir together until creamy, add the eggs and stir lots more. 10. Add the flour, 1 tbsp baking powder and 1 tsp ground cinnamon. 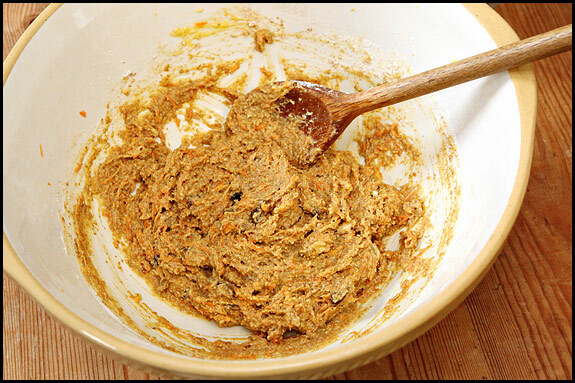 Give it all a jolly good mixing, then add an ounce or so of raisins, your chopped walnuts (an ounce or so), your grated carrots and the orange rind/zest or whatever it’s called and mix them in. 11. Add a little splosh of 100% orange juice if it looks a bit dry, and mix until you’re fed up of doing it. 12. Tip into greased cake tin and bung in oven for maybe half an hour or until you can push a knife into it and take it out without anything sticking to the blade. 13. Remove from cake tin and leave on wire rack to cool. 14. Mix some softened butter with icing sugar to make idiot icing for top of cake, and try to spread it on top without buggering up the cake, which is still quite hot and tends to fall apart if you’re not careful. 15. 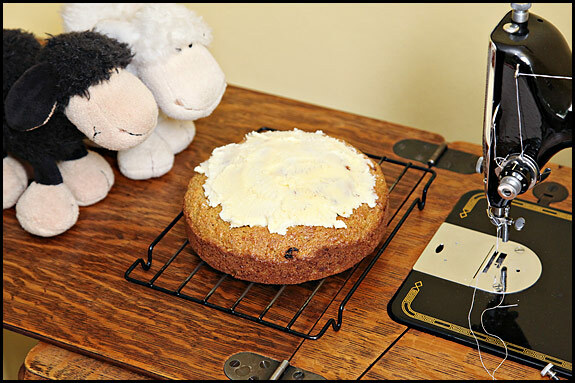 Wait until it’s cooled down a bit, then pig out on seriously scrummy carrot cake! Love it! I’m going to start freezing orange zest now too. Well, I must try that. Thanks for sharing. Ooooo, sounds wonderful! It hadn’t occurred to me to use spelt; I must try that! Gosh Dora, with the lousy weather we’re having over here, our blueberries haven’t even started turning blue yet! I love this post! Filled my moments with joy! Would love to eat some carrot cake, but I’m off to eat one of the fresh blueberry muffins I made yesterday morning before my [seemingly] marathon day of activity started! Thanks for sharing! Clever idea to freeze your grated orange. Does it loose much zestiness in the process? Oh, I finally mailed you those promised manuals. Hope they arrive soon. Cheers Lin. 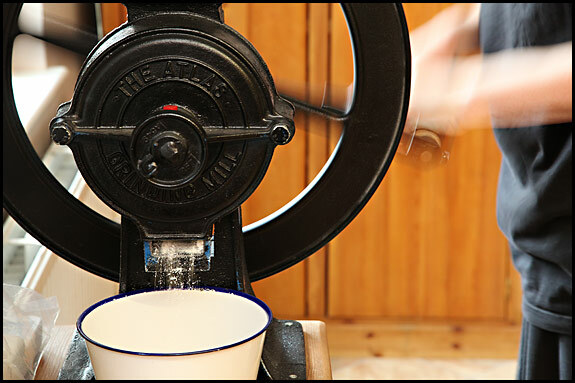 Commercially, flour is still ground between millstones in the UK – but only stoneground flour. Everything else is ground by high-speed roller mills, which first mill the grain to remove the bran and wheatgerm to produce white flour. The bran and the germ are then milled separately before being added back to the white flour, so it’s no wonder that unless it’s stoneground, your supermarket flour is such a poor thing. We started grinding our own because we were fed up of making our bread with flour which still had weeks to run before its sell-by date but was nevertheless totally stale.